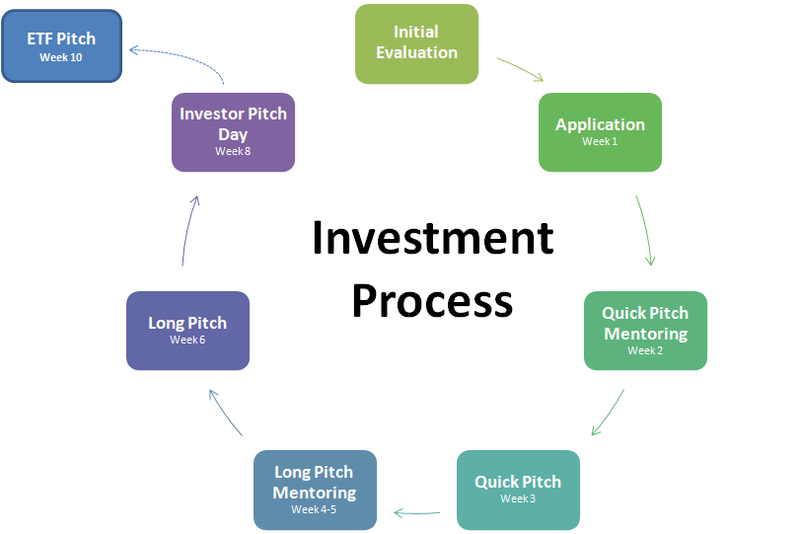 Our investment process is a mentor driven process which not only leads companies to a potential investment but also educates entrepreneurs/start-ups on the do’s and don’ts of how to make an investor pitch. As the North Texas RCIC staff mentors a company they are also learning about the critical areas of your business which expose the weaknesses as well as the strengths. Each applicant company will go through a multi-presentation process leading them to presenting at our Pitch Day event. Our Pitch Day event is a quarterly event that allows applicant companies that make it through our investment process to pitch to a room full of investors. These investors consist of Venture Capital Firms (both within Texas and outside), family offices, angels/angel groups, Texas Emerging Technology Fund (ETF), etc..
To learn more about the RCIC or if you are considering going through our investment process, the first step is to submit your company executive summary (sample executive summary template) via our “Submit a Plan” page. Once we receive your executive summary, we will schedule a one hour meeting to learn more about your company and for you to learn more about our funding process. We can go into further detail in regards to the Texas Emerging Technology Fund (ETF) during this meeting as well. We would like to meet with each company before you apply! Applications are accepted quarterly. The next application deadline is Tuesday, October 11, 2011. When submitting an Application, it should include all required documents listed below (in Word or PDF format) and it should be e-mailed (no hard copies accepted! ) by 5:00 p.m. on the deadline date to vikt@ntxrcic.org. The Quick Pitch will require each company to present for 10 minutes followed by 10 minutes of Q&A to a group of North Texas RCIC volunteer evaluators. These evaluators consists of local executives, entrepreneurs, technologists, etc.. They will have access to your application material before your presentation but you will have the ability to remove an evaluator if a conflict of interest exists. The North Texas RCIC team will mentor you before your Quick Pitch presentation to ensure you are prepared. Each evaluator will vote and if you receive positive feedback then you will move forward in the process to the Long Pitch. Each company will receive written feedback from each evaluator. The Long Pitch will require each company to present a more in depth presentation of 20 minutes followed by 15 minutes of Q&A to the same group of volunteer evaluators. The North Texas RCIC team will mentor you before your Long Pitch presentation to ensure you are prepared. Each evaluator will vote and if you receive positive feedback then you will move forward in the process to the Investor Pitch Day. Written feedback will also be provided to you by each evaluator. The Investor Pitch day will consist of each company presenting their long pitch followed by 15 minutes of Q&A to an audience of investors (local and out of state). Investors will be asked to provide anonymous feedback, address proof, as well as express any interest they may have in your company. The RCIC will make formal introductions between each investor that expresses interest and the company.